US, 1956, 74 minutes, Colour. 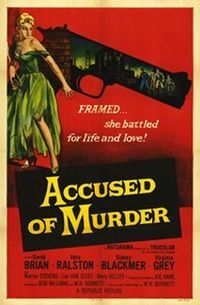 Accused of Murder is an entertaining, if implausible, murder mystery. It was one of the last films made by Republic Studios and features the president's wife, Vera Ralston. Herbert Yates, her husband, had made many films at the studios with her for over a decade. There is a strong supporting cast led by David Brian. It is interesting to note Lee Van Cleef in a supporting role as a fellow detective. The film is based on a story by W. H. Burnett, author of such stories as The Asphalt Jungle. Direction is by regular Republic director, Joseph Kane. 1. An entertaining thriller? Murder mystery? Detective thriller? A film of the 1950s? 2. Republic Studios production values, the city, colour photography? Action and pace? Musical score by Victor Young? 3. The title and its focus on Ilona, the mystery, audience attitudes, evidence, the final revelation? 4. The focus on Roy as a detective, his skill in his work, his responsibility to the precinct, his work with his assistant (and his oneupmanship as regards Roy)? The encounter with Ilona, the murder of Hobart, the investigations and theories, the interview with Sandra? His concern about Ilona and falling in love with her? His assistant's suspicions, not giving him the information? The pressure from the Chief? The reconstruction of the case? The encounters with Chad, the discussions about his responsibility, the discovery that llona had shot Hobart? The happy resolution? Portrait of a detective? 5. Ilona as heroine, singer, relationship with Hobart, her being promoted by him but not knowing it? The boss of the nightclub? Hobart's attentions, going off with him being followed by Chad? Hobart's death? her reactions, the visits by the detective, the evidence that she gave, concealing the truth, her fears? The suspicions of the assistant detective? The reconstruction of the crime? The court case, its effect, the revelation of the truth? The happy ending with Roy? 6. Hobart and his wealth debts? Bayliss and his hold over him, sending the killer? The pressures on Ilona, the flashbacks and the relationship, his death - and the irony of the truth? Not killed by Chad but by llona? 7. The criminals and the organisations, Bayliss and his organisation, henchmen? Chad and his following Hobart, the violence? 8. The relationship with Sandra and her blackmailing? the threats? The confrontation - and the irony of the truth? 9. Sandra and the dance hostesses, her chancing to see Chad, the line-up, her lies to the police, the blackmail with Chad, his beating her up, telling the truth? Her roommate and the evidence? 10. The material of detective stories, murder stories entertainingly presented?